My husband has been on quite the roll this summer, cooking up some delicious meals. I've been the one to normally wear the apron, and cook to my heart's content. But at one point he decided to take over the kitchen, and he hasn't really stopped! It was a nice and sweet change of pace, for sure! 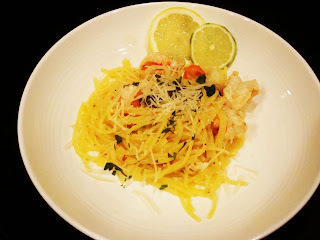 This weekend he whipped up this recipe, which is one of my faves in his repertoire of cooking. The first time he made the dish was for our 2nd Valentine's Day, in his apartment years back. I remember it being a week night, we were already head over heels in love, and we've shared many nights staying in, and he thought he'd try something different from his normal go to staples-which usually was heavy in red meat, such as meatloaf, Salisbury steak, and other dishes. I was so excited to see him step out of his Pennsylvania Dutch comfort zone. 1. Zest the citrus using a microplane, putting the zest into a little glass bowl, or off to the side of your cutting board. 2. Juice your fruit into another bowl. Before you juice, slice up a few slices of the citrus to reserve for garnishing. 3. Coarsely chop up some parsley, enough for garnish. Peel off shrimp shells and place into ice water bath. This helps keep shrimp fresh after peeling. Get out your pot for boiling pasta, and begin to boil some water. Our large pot takes a white to heat up, so we do this at the beginning of cooking. In a large skillet, heat the olive oil on a low-medium heat. Once pan is warm, add in all ingredients, except for the shrimp, and let everything come alive cooking together. By now your pot of boiling water should be ready, so add in your pasta. We love cutting corners where we can to save calories and sugars. We have been delighted by our recent discovery this summer of Quinoa pasta! And they have a linguine, which is rather on the slim side, when compared to regular linguine. To us, quinoa pasta tastes even better than whole wheat pasta! If you haven't tried it, you might just add it to your grocery list the next time you head out to do a little shopping. Now add in the shrimp to your amazing citrus-olive oil-wine bath. Cooking time will vary, but in the end, the shrimp will be done when it curls, and the color is white & orange-ish, firm to touch. You don't want to over cook the shrimp, for if you do shrimp will be rubbery. 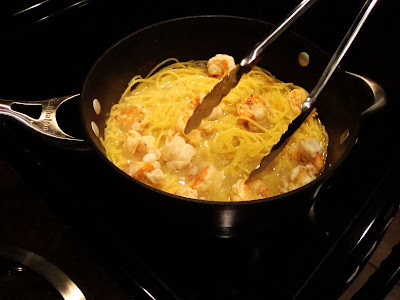 By now pasta should be done, and the shrimp should be cooked throughout, so at this point add in the pasta to the skillet of aromatic goodness, and lightly twist the pasta with tongs or a pasta spoon. Only a few twists and let all the ingredients mingle for a minute, then plate! Et voila! Your Spicy Citrus Shrimp Linguine is ready to be devoured! Sprinkle on some pretty green parsley & Parmesan cheese if desired, and a slice of lemon and lime for garnish. You'll have your guests saying wow! The flavors work really beautifully together, from the spice of the red pepper flakes, to the zing of the citrus, and the goodness of the shrimp, all mixed with the quinoa pasta! This dish is great in taste, and great for a healthy meal. Serve with a simple salad of chopped romaine lettuce and a Dijon vinaigrette, using white balsamic vinegar instead of red wine vinegar. So nice to see another TWIPS member who posts recipes as well :-) PS...I'm printing this one!